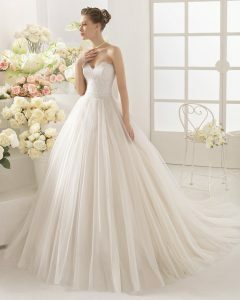 Your wedding day is probably the closest you will ever come to being a princess, make the most of the occasion. Of course, the dress is one of the biggest, and most exciting part of any upcoming nuptials, however, how you accessorise with the dress can have an enormous impact. When shopping for your tiara, consider every aspect of the dress you have chosen to wear on the day. The tiara should never overshadow the dress, but rather subtly accentuate it. Choose a tiara that is adorned with jewels that are similar to the bead work on your gown, in shape, and color. Tiaras come in a wide variety of shapes, sizes, colors, and embellished with an array of different jewels. What you select should be a reflection of your personality. Big, bold, and flashy will usually indicate a personality that is outgoing, outspoken, and a little on the wild side. While something that is more delicate, and refined may indicate an introvert, or someone is a tad on the shy side. Don’t be afraid to let your personality shine through. Just as the hairstyle for your wedding day is carefully considered, and the design of your dress taken into account, so should the same degree of thought go into the tiara you choose to wear. Wear a tiara that compliments the dress style, and the hairstyle. There is no use wearing a dainty, almost hidden tiara when your chosen hairstyle is going to mask it anyway. Neat, up-style buns, or hair hanging loosely will properly accentuate the beauty of your tiara, whereas wilder, more messy looks may be complimented by a larger tiara selection. Take your time in choosing the tiara you want to wear on the day. When you find the right one, wearing it will transform you from a bride, to a princess bride.